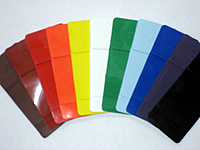 We have over 20 years of experience in making colored rubber compound sustaining the customers' confidence in us. 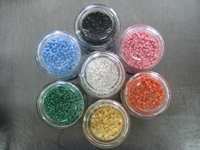 Demand for colored resin compound is also rising in recent years. Color compound is a kneading of rubber except black. Conventionally, carbon black was used for rubber reinforcement agent; thus, rubber kneading was mostly in black. At K3, we started rubber kneading in multiple colors since 1983 in order to correspond with the customers' needs. The black piece in the photo has a black coloring agent added. We have been equipped with moisture heat Kneader in quite early period. We first started manufacturing rubber resin mixed color compound. Small lot order form 75L is possible. We are capable of color resin kneading which process is more difficult than conventional extruding. With installation of oil heated kneader, we are further able to meet the demand of wide variety of color resin kneading now. We Can Handle Your Small Volume Order. 2011 (c) K Three Co., Ltd. All Rights Reserved.